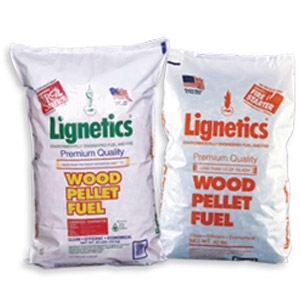 Lignetics® wood pellets are made from recycled, renewable sawmill waste. Our wood pellets contain all-natural biomass products and are manufactured at the highest quality control levels, designating our wood pellet fuel as premium grade. Lignetics premium wood pellets produce a consistent, high BTU output and produce less than one percent ash. This translates to a hotter, more efficient burn, which means less wood pellets burned, fewer wood pellets purchased, less space needed for storage, fewer trips to the wood pellet hopper and less waste to clean up. 40 lbs.